The topic of this final article will be to build a neural network regressor using Google's Open Source TensorFlow library. For a general introduction into TensorFlow, as well a discussion of installation methods, please see Mihajlo Pavloski's excellent post TensorFlow Neural Network Tutorial. In the last article (part 2) I described the process of building a linear regression model, a venerable machine learning technique that underlies many others, to predict the mean daily temperature in Lincoln, Nebraska. Linear regression models are extremely powerful and have been used to make numerical, as well as categorical, predictions since well before the term "machine learning" was ever coined. However, the technique has some criticisms, mostly around its ridged assumption of a linear relationship between the dependent variable and the independent variable(s). An uncountable number of other algorithms exist in the data science and machine learning industry which overcome this assumption of linearity. One of the more popular areas of focus in recent years has been to apply neural networks to a vast array of machine learning problems. Neural networks have a powerful way of utilizing learning techniques based on both linear and non-linear operations. Neural networks are inspired by biological neurons in the brain which work in a complex network of interactions to transmit, collect, and learn information based off a history of the information that has already been collected. The computational neural networks we are interested in are similar to the neurons of the brain in that they are a collection of neurons (nodes) that receive input signals (numerical quantities), process the input, and transmits the processed signals to other downstream agents in the network. The processing of signals as numerical quantities that pass through the neural network is a very powerful feature that is not limited to linear relationships. In this series I have been focusing on a specific type of machine learning called supervised learning, which simply means that the models being trained are built using data that has known target outcomes that the model is trying to learn to predict. Furthermore, the type of predictions being made are numerical real values, which means we are dealing with regressor prediction algorithms. 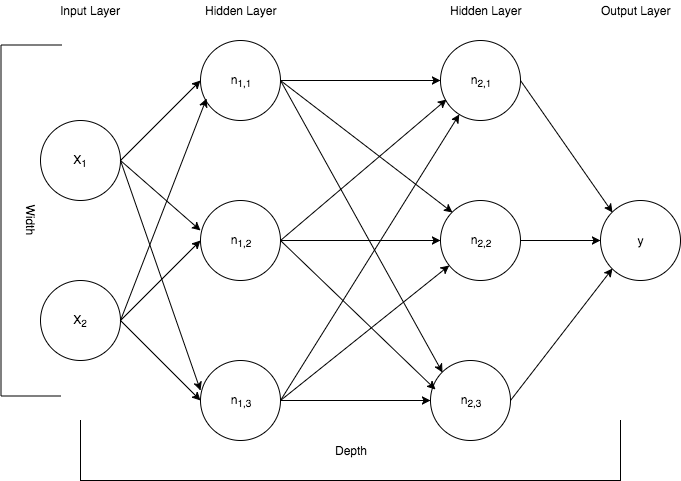 Graphically, a neural network similar to the one being described in this article is shown in the image below. The neural network depicted above contains an input layer on the far left representing two features, x1 and x2, that are feeding the neural network. Those two features are fed into the neural network, which are processed and transmitted through two layers of neurons, which are referred to as hidden layers. This depiction shows two hidden layers with each layer containing three neurons (nodes). The signal then exits the neural network and is aggregated at the output layer as a single numerical predicted value. Let me take a moment to explain the meaning behind the arrows signifying data being processed from node to node across the layers. Each arrow represents a mathematical transformation of a value, beginning at the arrow's base, which is then multiplied by a weight specific to that path. Each node within a layer will be fed a value in this way. Then all the values converging at the node are summed. It is this aggregate of multiplying by weights and summing the products that define the linear operations of a neural network I mentioned earlier. After summation is carried out at each node a special, non-linear, function is applied to the sum, which is depicted in the image above as Fn(...). This special function that introduces non-linear characteristics into a neural network is called an activation function. It is this non-linear characteristic brought about by activation functions that give multi-layer neural networks their power. If it was not for the non-linearity added to the process then all layers would effectively just algebraically combine into one constant operation consisting of multiplying the inputs by some flat coefficient value (ie, a linear model). Alright, so that is all fine and dandy, but I hope you are wondering in the back of your mind... ok, Adam, but how does this translate into a learning algorithm? Well the most straight forward answer to that is to evaluate the predictions being made, the output of the model "y", to the actual expected values (the targets) and make a series of adjustments to the weights in a manner that improves the overall prediction accuracy. In the world of regressor machine learning algorithms one evaluates the accuracy by using a cost (aka "loss", or "objective") function, namely the sum of squared errors (SSE). Notice that I generalized that statement to the whole continuum of machine learning, not just neural networks. In the prior article the Ordinary Least Squares algorithm accomplished just that, it found the combinations of coefficients that minimized the sum of the squared errors (ie, least squares). Our neural network regressor will do the exact same thing. It will iterate over the training data feeding in feature values, calculate the cost function (using SSE) and make adjustments to the weights in a way that minimizes the cost function. This process of iteratively pushing features through the algorithm and evaluating how to adjust the weights based off the cost function is, in essence, what is known as model optimization. Model optimization algorithms are very important in building robust neural networks. 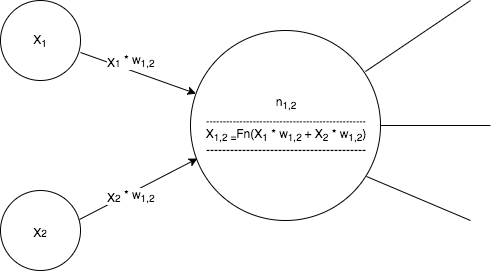 As examples are fed through the networks architecture (ie, the width and depth) then evaluated against the cost function, the weights are adjusted. The models is said to be "learning" when the optimizer function identifies that a weight adjustment was made in a way that does not improve (lower) the cost function, which is registered with the optimizer so that it does not adjust the weights in that direction again. Google's TensorFlow library consists a few API's, with the most popular being the Core API, which gives the user a low level set of tools to define and train essentially any machine learning algorithm using symbolic operations. This is referred to as TensorFlow Core. While TensorFlow Core is an amazing API with vast application capability, I will be focusing on a newer, higher level, API the TensorFlow team developed that is collectively referred to as the Estimator API. The TensorFlow team developed the Estimator API to make the library more accessible to the everyday developer. This high level API provides a common interface to train(...) models, evaluate(...) models, and predict(...) outcomes of unknown cases similar to (and influenced by) the popular Sci-Kit Learn library, which is accomplished by implementing a common interface for various algorithms. Also, built into the high level API are a load of machine learning best practices, abstractions, and ability for scalability. All of this machine learning goodness brings about a set of tools implemented in the base Estimator class as well as multiple pre-canned model types that lowers the barrier to entry for using TensorFlow so it can be applied to a host of everyday problems (or opportunities). By abstracting away much of the mundane and manual aspects of things like writing training loops or dealing with sessions, the developer is able to focus on more important things like rapidly trying multiple models and model architectures to find the one that best fits their need. In this article I will be describing how to use one of the very powerful deep neural network estimators, the DNNRegressor. Now let us get our hands on the data and take a couple of peaks at it again to familiarize ourselves with it. I have placed all the code and data in my GitHub repo here so that readers can follow along. Note that we have just under a 1000 records of meteorological data and that all the features are numerical in nature. Also, because of our hard work in the first article, all of the records are complete in that they are not missing (no non-nulls) any values. Now I will remove the "mintempm" and "maxtempm" columns as they have no meaning in helping us predict the average mean temperatures. We are trying to predict the future so we obviously can not have data about the future. I will also separate out the features (X) from the targets (y). As with all supervised machine learning applications, I will be dividing my dataset into training and testing sets. However, to better explain the iterative process of training this neural network I will be using an additional dataset I will refer to as a "validation set". For the training set I will be utilizing 80 percent of the data and for the testing and validation set they will each be 10% of the remaining data. To split out this data I will again be using Sci-Kit Learn's train_test_split(...). optimizer: An instance of tf.Optimizer subclass, which optimizes the model's weights during training; its default is the AdaGrad optimizer. I will begin by defining a list of numeric feature columns. To do this I use the tf.feature_column.numeric_column() function which returns a FeatureColumn instance for numeric, continuous-valued features. With the feature columns defined I can now instantiate the DNNRegressor class and store it in the regressor variable. I specify that I want a neural network that has two layers deep where both layers have a width of 50 nodes. I also indicate that I want my model data stored in a directory called tf_wx_model. The next thing that I want to do is to define a reusable function that is generically referred to as an "input function", which I will call wx_input_fn(...). This function will be used to feed data into my neural network during the training and testing phases. There are many different ways to build input functions, but I will be describing how to define and use one based off the tf.estimator.inputs.pandas_input_fn(...) since my data is in a pandas data structures. Notice that this wx_input_fn(...) function takes in one mandatory and four optional parameters which are then handed off to a TensorFlow input function specifically for pandas data, which is returned. This is a very powerful feature of the TensorFlow API (and Python and other languages that treat functions as first class citizens). num_epochs: An optional parameter. An epoch occurs when the algorithm executes over the entire dataset one time. With our input function defined we can now train our neural network on our training dataset. For readers who are familiar with the TensorFlow high-level API you will probably notice that I am being a little unconventional about how I am training my model. That is, at least from the perspective of the current tutorials on the TensorFlow website and other tutorials on the web. Normally you will see something like the following when one trains one of these high level API pre-canned models. Then the author will jump right into demonstrating the evaluate(...) function and barely hint at describing what it does or why this line of code exists. And after this they'll jump straight into executing the predict(...) function assuming all is perfect with the trained model. For the ML newcomer reading this type of a tutorial I cringe. There is so much more thought that goes into those three lines of code that warrants more attention. This, I feel, is the only downside to having a high level API - it becomes very easy to throw together a model without understanding the key points. I hope to provide a reasonable explanation of how to train and evaluate this neural network in a way that will minimize the risk of dramatically under fitting or overfitting this model to the training data. So, without further delay let me define a simple training loop to train the model on the training data and evaluate it periodically on the evaluation data. INFO:tensorflow:Saving checkpoints for 1 into tf_wx_model/model.ckpt. INFO:tensorflow:Saving checkpoints for 40000 into tf_wx_model/model.ckpt. INFO:tensorflow:Loss for final step: 4557.79. The above loop iterates 100 times. In the body of the loop I call the train(...) method of the regressor object, passing it my reusable wx_input_fn(...) which is in turn passed my training feature set and targets. I purposefully left the default parameters num_epochs equal to None, which basically says "I don't care how many times you pass over the training set just keep going training the algorithm against each default batch_size of 400" (roughly half the size of the training set). I also left the shuffle parameter equal to its default value of True so that while training, the data is selected randomly to avoid any sequential relationships in the data. The final parameter to the train(...) method is steps which I set to 400, which means the training set will be batched 400 times per loop. Now you might be wondering why I executed and evaluate(...) method for each iteration of the loop and captured its output in a list. First let me explain what happens each time time the train(...) method is fired. It selects a random batch of training records and pushes them through the network until a prediction is made, and for each record the loss function is calculated. Then based off the loss calculated the weights are adjusted according to the optimizer's logic, which does a pretty good job at making adjustments towards the direction that reduces the overall loss for the next iteration. These loss values, in general as long as the learning rate is small enough, decline over time with each iteration or step. However, after a certain amount of these learning iterations the weights start to be influenced not just by the overall trends in the data but, also by the uninformative noise inherit in virtually all real data. At this point the network is over-influenced by the idiosyncrasies of the training data and becomes unable to generalize predictions about the overall population of data (ie, data it has not yet seen). This relates to the issue I mentioned earlier where many other tutorials on the high-level TensorFlow API have fallen short. It is quite important to break periodically during training and evaluate how the model is generalizing to an evaluation, or validation, dataset. Lets take a moment to look at what the evaluate(...) function returns by looking at the first loop iteration's evaluation output. As you can see it outputs the average loss (Mean Squared Error) and the total loss (Sum of Squared Errors) for the step in training which for this one is the 400th step. What you will normally see in a highly trained network is a trend where both the training and evaluation losses more or less constantly decline in parallel. However, in an overfitted model at some point in time, actually at the point where over fitting starts to occur, the validation training set will cease to see reductions in the output of its evaluate(...) method. This is where you want to stop further training the model, preferably right before that change occurs. Now that we have a collection of evaluations for each of the iterations let us plot them as a function of training steps to ensure we have not over-trained our model. To do so I will use a simple scatter plot from matplotlib's pyplot module. Cool! From the chart above it looks like after all those iterations I have not overfitted the model because the evaluation losses never exhibit a significant change in direction toward an increasing value. Now I can safely move on to making predictions based off my remaining test dataset and assess how the model does as predicting mean weather temperatures. Similar to the other two regressor method I have demonstrated, the predict(...) method requires an input_fn which I will pass in using the reusable wx_input_fn(...), handing it the test dataset, specifying the num_epochs to be one and shuffle to be false so that it is sequentially feeding all the data to test against. Next, I do some formatting of the iterable of dicts that are returned from the predict(...) method so that I have a numpy array of predictions. I then use the array of predictions with the sklearn methods explained_variance_score(...), mean_absolute_error(...), and median_absolute_error(...) to measure how well the predictions fared in relation to the known targets y_test. This tells the developer what the predictive capabilities of the model are. I have used the same metrics as the previous article covering the Linear Regression technique so that we can not only evaluate this model, but we can also compare them. As you can see the two models performed quite similarly with the more simple Linear Regression model being slightly better. However, an astute practitioner would certainly run several experiments varying the hyper-parameters (learning rate, width, and depth) of this neural network to fine tune it a bit, but in general this is probably pretty close to the optimal model. This brings up a point worth mentioning, it is rarely the case, and definitely not advisable, to simply rely on one model or the most recent hot topic in the machine learning community. No two datasets are identical and no one model is king. The only way to determine the best model is to actually try them out. Then once you have identified the best model there are other trade-offs to account for, such as interpretability. This article has demonstrated how to use the TensorFlow high-level API for the pre-canned Estimator subclass DNNRegressor. Along the way I have described, in a general sense, the theory of neural networks, how they are trained, and the importance of being cognizant of the dangers of overfitting a model in the process. Demonstrate the general process for undertaking an analytics (machine learning, data science, whatever...) project from data collection, data processing, exploratory data analysis, model selection, model building, and model evaluation. Demonstrate how to select meaningful features that do not violate key assumptions of the Linear Regression technique using two popular Python libraries, StatsModels and Scikit Learn. Demonstrate how to use the high level TensorFlow API and give some intuition into what is happening under all those layers of abstraction. Discuss the issues associated with over fitting a model. Explain the importance of experimenting with more than one model type to best solve a problem. Thank you for reading. I hope you enjoyed this series as much as I did and, as always I welcome comments and criticism.